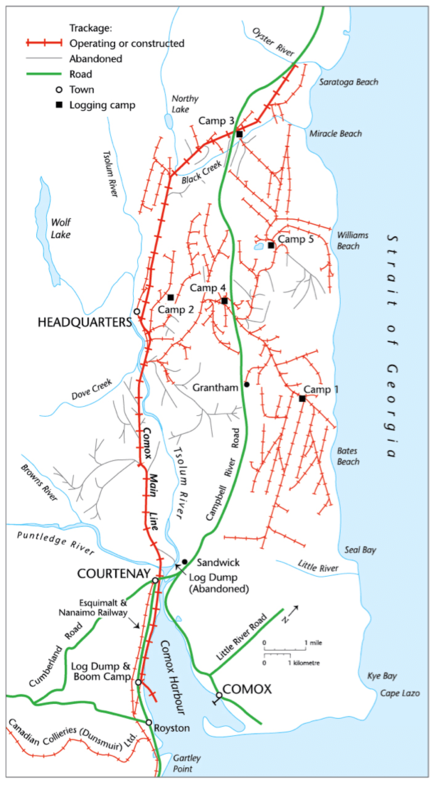 Photo Caption: Comox Logging railways and camps, c. 1917, from Island Timber p. 115, redrawn by Eric Leinberger from a map by Robert Turner in his book Logging by Rail. In the late 1990s I embarked on a history of the Comox Logging & Railway Company in the era of highlead and steam-driven logging, 1910-1945. My efforts resulted in two books, Island Timber(2000) and Mountain Timber (2009), both published by Sono Nis Press. At this year’s NiCHECanadian History & Environment Summer Schoolfield trip, I shared the creative process behind those books. As soon as I started my interviews, I found I was mining the same rich seam of logging stories thatJack Hodgins tapped for his novels set in the Comox Valley. I filled two filing cabinets with interviews and copies of photos, maps, and documents from many informants, including Jack’s father Stan Hodgins. This was a gratifying process, but I was at a loss to know how to organize the material. I turned to the existing literature and considered several schools of BC logging and forest history, including popular history, which concerned what might be called the “Glory Days of Logging” – big trees, big men, big machines, and heroic stories of male-dominated logging camps; labour history, which dealt with union recognition, labour activism, and the deskilling and degradation of work; corporate history, which focused on the political and financial dealings of logging owners and companies; and forest policy, which explored the politics, decisions, and disagreements of government foresters, company officials, and union bosses. Popular history relied on photographs of big men, big trees, and big logs; labour, corporate, and forest history depended on trade journals, newspapers, archival records, and on policy decisions made by men wearing suits and ties. My interviews consistently involved land, logs, camps, words, work, ingenuity, danger, sweat, steam, grease, and rain. Paralysis set in when I realized that the existing approaches did not apply. None of them provided useful analytical or explanatory frameworks, and an adherence to any one of them would have limited my rich collection of raw material. Somehow I wanted to be true to it. I was in a quandary about how to write the book. How could I arrange my personal archive into something accurate, authentic, representative, and significant? I wanted to mirror and maximize the raw material. My structure had to be appropriate to the material. And now everything fell into place. “Stump to dump” provided the analytical framework I so badly needed. It allowed me to shape the stories, photos, and maps into an accurate representation of the work of 400 men over forty years, and over 60,000 acres. 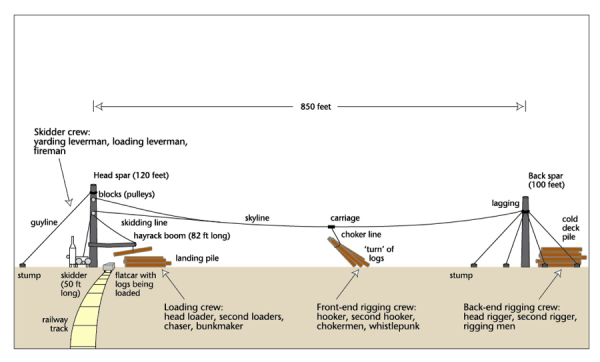 Every stage of “stump to dump” would be a chapter in a book: first came the capitalists who acquired the timber land from the Dunsmuirs; then came the timber cruisers, who calculated the species and quantity of timber; then came the engineers, who laid out the logging settings and railways; then came the grade crews and steel gangs, who extended the railway spur lines into new settings; then the fallers and buckers, who cut the trees down and into 40-foot lengths; then the logging crews, who yarded logs in the forest and loaded them onto 40-foot flatcars; then the railway crews, who hauled the logs to the “dump” at Royston on the Strait of Georgia; then the boom crews, who dumped and boomed the logs; then the tugboat crews, who towed the logs across the Strait to Fraser Mills at New Westminster. Every logging occupation was a step in the process, and I could attach all 400 working lives and every interview to precise points in the transit of logs. And now my raw material made sense. Every chapter contained four components: a central and unifying stump-to-dump narrative; numerous sidebars for material, such as short biographies, that would otherwise disrupt the narrative flow; photographs with explanatory captions; and maps with captions. Because I had twelve chapters, I had to juggle 48 files on my computer, but the generous size of the book (coffee table or 8.5 x 11) allowed me to include 300 photographs, 100 sidebars, 30 maps, and 150,000 words of text. In my interviews I had also realized the importance of the social history of logging – communities, camps, families, schools — and I was determined to make room for such material. I was also interested in the aftermath of logging: slash fires, natural regeneration, temporary abundance of game, and the Depression-era scavenging and foraging by logging families in the clear-cuts. In the end, I deployed elements of my training in archaeology, with its material and spatial emphasis; in history, with its concern with patterns, personality, and processes; and in historical geography, with its practical emphasis on base maps, horizontal and vertical cross-sections, and regional analysis. I was struck by the homespun, individualistic, and inductive nature of my own intellectual enterprise after attending the talk at NiCHE’s CHESS of Bea Alex, Jim Clifford, Colin Coates, and Uta Hinrichs on mining big data sets for the global trade in commodities. Instead of using algorithms or trawling millions of documents, I learned to listen to my sources. The loggers knew their job better than anyone. Stump to dump was the key that unlocked, for me, the door into the history of logging on Vancouver Island — and I believe this model would apply to any logging show on earth. Dr. Richard Mackie is a historian of Vancouver Island and Associate Editor of BC Studies. Two great books. Is a third coming? Hi Barry, I hope so! But I am busy with a new venture now, The Ormsby Review, which is taking much time http://bcbooklook.com/2016/09/16/welcome-to-the-ormsby-review/#more-28947 The third book is on the back burner. Thanks for your interest.